Chocolate Chex Scotcheroos is a simple, gluten free holiday dessert recipe similar to Rice Krispies treats and made with peanut butter, chocolate, and butterscotch chips! These are great for Christmas but perfect for all occasions! Hooray for holiday desserts! This is a great time of year, isn’t it? I have to work out every single day just so I can enjoy the sugary sweets that are inevitably all around me at all times. Oh, and could these Chocolate Chex Scotcheroos be any cuter? Best part – they are NO bake! No need to spend all day baking when you’re having a holiday party. I have found that people love the simple desserts just as much as that cake that took all day to make. Now don’t get me wrong – I love a good eggnog cake or holiday rum cake! All I’m saying is, these Chocolate Chex Scotcheroos may have been raved about even more than a cake that took me hours. Last year, they were gone before any of the “real” cookies where! They’re fun to make, fun to eat, and they have a super fun name. Whatever the occasion may be (not just for Christmas), just make these Chocolate Chex Scotcheroos happen soon. Enjoy! 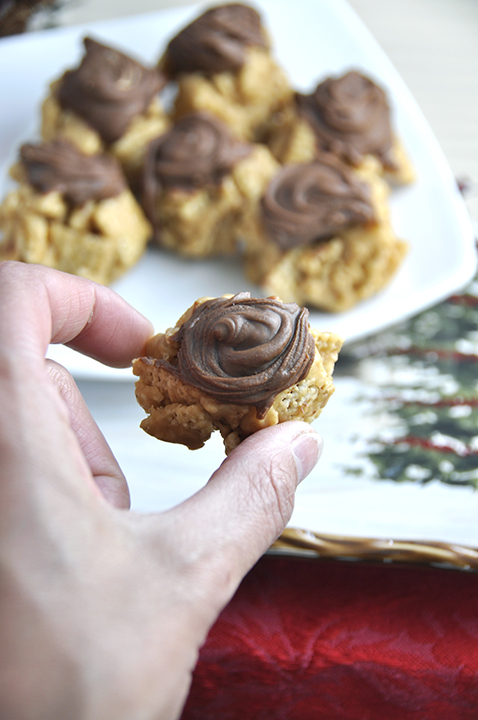 Chocolate Chex Scotcheroos is a simple, gluten free holiday dessert recipe similar to Rice Krispies treats and made with peanut butter, chocolate, and butterscotch chips! These are great for Christmas! Stir together the corn syrup and sugar in a small pan. Cook over medium heat, stirring frequently, until sugar is dissolved and mixture begins to boil. Remove from heat and stir in the 1.5 cups of peanut butter until combined. 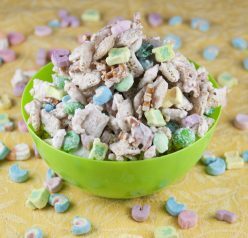 Pour this mixture over your 6 cups of Chex cereal and fold together until cereal is fully coated. Drop by spoonfuls onto wax paper or silicone baking mat. In a microwave-safe bowl, melt together the chocolate chips, butterscotch chips, ¼ cup of peanut butter and vanilla at 50% power, stirring every 20-30 seconds so chocolate does not burn. Once fully melted, spoon the mixture over the cookies. 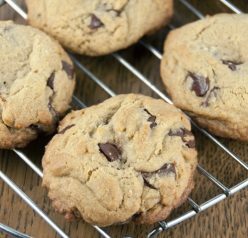 Allow to cool completely and chocolate to harden at room temperature before eating. I will take 5, please 🙂 Love these Ashley! I have to skate just about every day so I can eat all the desserts. 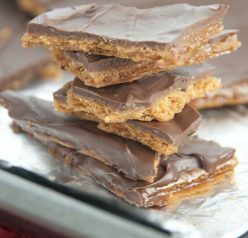 I need to add your scotcheroos to the “must eat” list! This is a fun snack for kids. Those look awesome, please pass me a few! These look so delicious! What a fun idea. These are so cute – what a great holiday treat! It looks so cute <3 must be delicious. 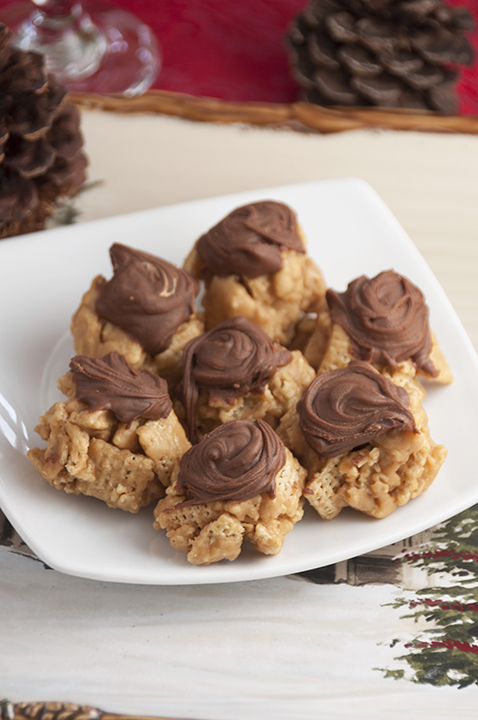 I love Scotcheroos…and this is such a fun and delicious twist for the holidays! So many good flavors going on here. Can’t wait to start baking for Chruatmas!! Scotcheroos!!! Eeeee. Peanut butter + butterscotch = like the best thing EVER. No bake treats like this are so nice during the holidays! My oven is normally over worked anyways so these are great!